The International School of Tianjin (IST) was the first venue outside Beijing to host our children’s coaching programmes. Classes have been running at the school since Autumn 2009, and take place on the grass pitches at the school’s impressive campus in the Jinnan district, south of the city centre. Classes are available for players aged from Kindergarten (at least 4.5 years old) to Grade 8. As with many of ClubFootball's school venues children who do not attend IST are welcome to join, however students who do go to the school will be given priority booking if courses are over-subscribed. Please click the links on the left for more specific details about the times and dates of Current or Upcoming Courses. If you do decide to register, please be sure to read the Course Notes and pay particular attention to the school-specific rules listed. Before registering, please also read the notes on refunds and registration FAQ's in the Register section in the toolbar at the top of the page. ClubFootball would like to extend its thanks to programme hosts, International School of Tianjin. To learn more about International School of Tianjin, please to visit the school's website. 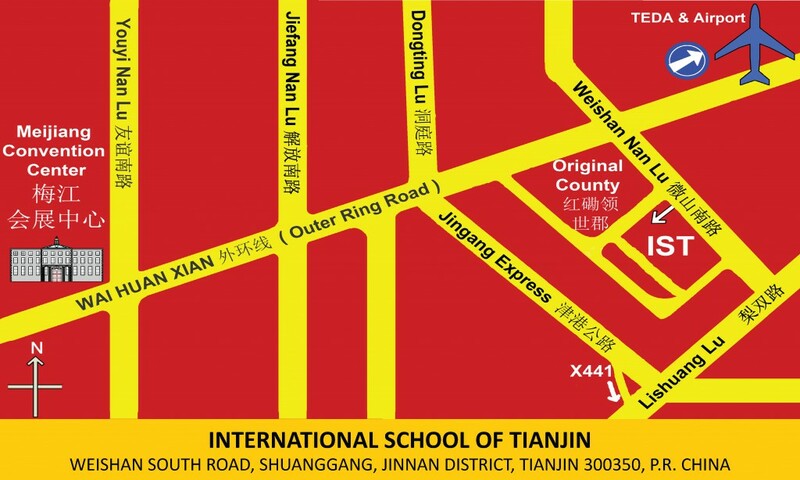 The International School of Tianjin is located at Weishan South Road, Shuanggang, Jinnan District, Tianjin, just 1km from Waihuanxian (Outer Ring Road).